Speaker of the Senate Nehaarika Mulukutla, a Weinberg sophomore, leads Wednesday’s meeting. Senate voted to approve the Rules Committee’s recommendations to punish Christina Cilento and Macs Vinson. There was no precedent for Wednesday’s Senate meeting. 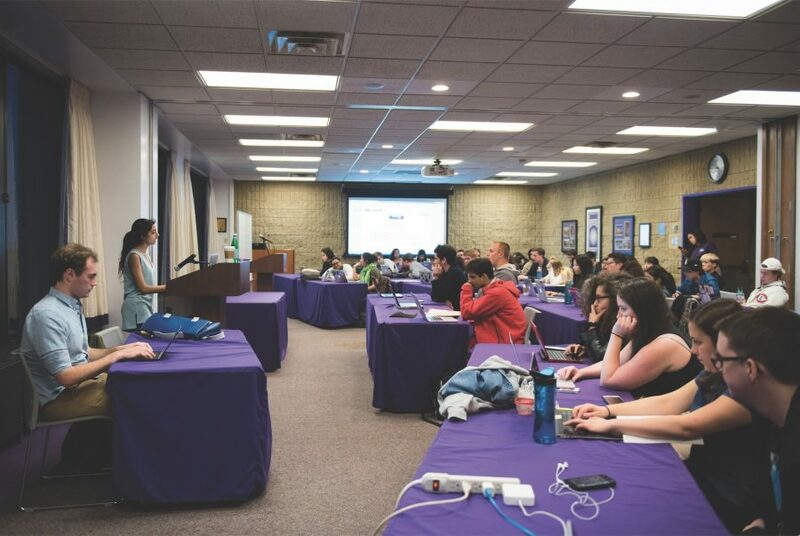 “Our code is extremely outdated,” said Speaker of the Senate Nehaarika Mulukutla, a Weinberg sophomore. So, Senate broke new ground: It considered and then affirmed rules to govern an impeachment trial for a sitting president and executive vice president, then it voted to approve punishments for student government’s highest officials. The lengthy session often dealt in parliamentary procedure, as obscure bylaws, such as a “motion to read papers” to introduce unreleased evidence of voting data, came into play as Senate took up unprecedented proceedings. The impeachment hearing allowed senators to decide whether or not to punish ASG president Christina Cilento and executive vice president Macs Vinson as the Rules Committee recommended. The committee recommended, and the Senate approved, the two publicly apologize, and that Cilento do 10 hours of community service. Impeachment hearings occur when the Rules Committee finds that an accused party committed a violation, and it does not necessarily lead to removal from office or a revote, said former parliamentarian Scott Spicer, a Weinberg senior. The Senate meeting began by debating the rules for a possible hearing. Senators spent roughly 45 minutes considering two proposed amendments that would open debate in an impeachment hearing to non-senators. The first amendment failed, leading to the approval of a 10-minute speaking period for non-elected students. However, no one ended up speaking during this allotted time during the hearing. The hearing began with parliamentarian Shelby Reitman, a Weinberg sophomore, announcing the Rules Committee’s recommendations for punishment. Next, Weinberg junior Lauren Thomas, the election commissioner, outlined the ticket’s violations of ASG’s election guidelines. Then Cilento stood before Senate and, with Vinson behind her, offered an apology, but she placed more fault with SESP sophomore Kevin Corkran, the election commission member who leaked the information and has since resigned from ASG. When Senate moved into debate, some senators raised concerns about the election’s credibility and the feasibility of a re-vote. Weinberg junior Will Pritzker spoke against the recommended punishments and said although an apology should be “a given,” more needed to be done. Other senators disagreed. Weinberg sophomore Eliott Sassouni, who serves on the Rules Committee, said although he was initially in favor of a revote, he realized it wouldn’t achieve a record turnout like the first election. Eventually, Senate moved into voting procedure, which was done through secret ballots. A majority of senators voted against using secret ballots, but because more than one-fifth wanted them, pen-and-paper voting was used. At about 10:30 p.m., Mulukutla counted and announced the results. Senate approved the Rules Committee’s punishment recommendation that Cilento and Vinson both publicly apologize with 26 senators voting for, nine against and one abstaining. When Cilento addressed Senate before the proceedings, she admitted to a lapse in judgment and pledged to be a resource for students, apologizing to the students and student groups who endorsed her.